The Barnsley War Memorials Project have just about completed our first volunteers project - to transcribe the 1918 Absent Voters' List for Barnsley and surrounding area. This was compiled following the changes in electoral franchise extending the vote to all men over 21 and to women over 30 who fulfilled certain property requirements. So all servicemen who were over 21 or who would be 21 by the forthcoming General Election in 1918 were registered to vote. You can access the transcriptions from the Absent Voter page of the BWMP website. There have only been two women found on the list (as far as I am aware). I wrote about one a few months ago, Katherine Blackburn of Sheffield Road, Barnsley, who was a Nurse in the Territorial Force Nursing Service. One of the very last transcriptions to be returned from our volunteers has turned up another, Lucy Hilary Johnson, a Red Cross Nurse. As you can see another person from the same address, 46 Church Street, is also in the forces - Alfred Lancelot Johnson is a Private in the Royal Army Medical Corps. A search of the 1911 census shows Lucy and Alfred living at 46 Church Street with their widowed mother Margaret and another two sisters. Lucy's occupation was entered as Spinster I think, but it has been rubbed or scratched out. Alfred is listed as a Chemist. Margaret has filled in the details about the length of her marriage and children born to it, even though as a widow she hadn't needed too - in fact the census enumerator has struck the information through with red ink - but it's very useful for us! She had been married for 49 years and borne 10 children, of whom 3 have already died. The family proved a little elusive in 1901, as it transpired because Margaret and her husband John were away from home on census night. I did find three of their grown up children living at York Terrace, Stairfoot - and cross checking on Ancestry I found that John Johnson was on the Electoral Roll for that address in 1899. John Johnson died on 12 September 1910 and in the notice above we can see that he had been the Manager of Carlton Main Colliery and had been 71 years old when he died. He left £4737 18s 10d in his will according to the Probate index entry on Ancestry where, as one of his executors, Alfred Lancelot Johnson is referred to as a Chemist's Manager. Margaret died in 1911 and both are buried in Barnsley Cemetery along with sons William Matthew Johnson (d. 1895 aged 31) and Richard Aaron Johnson (d.1894 aged 24). I don't know who the other child who died young is yet - but the family was living in Carlton in 1891 and before that in Halesowen where Alfred was born and Wales where the older children were born so another child could have died in any of these places. John Johnson and Margaret Parker were both from the North East of England and had married in the June Quarter (April, May, June) of 1861 in the Newcastle upon Tyne district. She was born in around 1839 in Winlaton, just south of the river Tyne in Durham and I have identified her family easily in the 1861 census (7 April 1861) as helpfully her younger sister and brother are living with the Johnson family Wrexham in 1871. Her brother Richard is living next door to them in 1881 in Halesowen too, married to a Welsh girl and with two children. John Johnson, also born around 1839, gives his birthplace as Gosforth, Northumberland in the 1881 and 1891 census returns and was much harder to trace, however he is most probably the son of Matthew Johnson (Matthew being the middle name of two of his sons) who was a Overman in the Colliery in Winlaton in 1851, despite the family reporting their origin as Longbenton, Northumberland (just 2 miles from Gosforth). This does seem to fit nicely with him marrying a girl from Winlaton a few years later. Their eldest son William Matthew Johnson's death is also reported in the Sheffield newspapers - he had been a Bank Clerk in Sheffield and had died at Crookes in Sheffield in 1895 of typhoid fever aged 31. The report also notes that whilst living at Carlton he had been a Sunday School teacher there, travelling regularly between the village and his employment in Sheffield. Unfortunately the report is spread over two columns of the newspaper and the bottom part of one section is missing on Find My Past. Despite a good search I can can find no further mentions in the Sheffield papers (which are the nearest that appear on Find My Past as yet) of John Johnson's career - there should be an obituary in the Barnsley Chronicle, so I'll put that on my to do list for next time I visit Barnsley Archives. The book, Barnsley Streets Volume 1, states that L H Johnson was living at 46 Church Street from 1906 to 1929. It seems odd that the entry would be in Lucy's name when John and Margaret would have been the senior householders ... but maybe Mr Tasker was just being economical with his records and bundling all the entries under the name of the person who lived there for the longest. 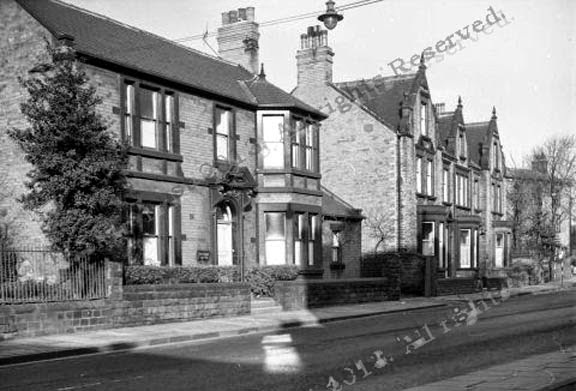 All of the houses in the photo above, from the Tasker Trust website, were demolished when the road was widened and a roundabout put in, roughly opposite Barnsley College I estimate from the information in the book. Lucy was 34 years old in 1911, so when she was listed as a Red Cross Nurse in 1918 she would have been 41, but obviously playing her part in the war and living away from home to do it. In 1915 the War Office proposed that volunteer nurses, known as VADs (Voluntary Aid Detachments) could work in RAMC hospitals (lots more details on the Red Cross website) - I can't find a record for her on Lives of the First World War so maybe she did not work abroad. Her brother Alfred appears to have been invalided out of the RAMC in 1919 with malaria, at which time he was a Sergeant, according to a detailed Pension Record available for him on Ancestry. A little younger than Lucy, he was 35 years old when he enlisted in April 1916. His occupation was given as Dispensing Chemist and he had dentures fitted! I expect that his peacetime occupation made him a perfect candidate for the Royal Army Medical Corps - and he must have served overseas as he has medal records showing that he was entitled to the British War Medal and Victory Medal. Both Mary Lizzie and Margaret Dinah Johnson, the sisters who are at home with their mother, Lucy and Alfred in 1911 die unmarried and are buried in Barnsley Cemetery, Margaret in 1921 in Barnsley and Mary in 1838 in Harrogate. Lucy herself dies in 1955 aged 78 years also in Harrogate according to her Probate index entry on Ancestry, but she does not appear to be buried in Barnsley. She leaves £17,424 6s 2d and her executor is Alfred Lancelot Johnson, retired Chemist. That is a substantial amount of money - worth around £300,000 today (there is a handy converter on the National Archives website). Alfred, possibly the last of the family, dies in Cheshire in 1965 aged 84 - did he marry? I don't know. And I haven't accounted for all of John and Margaret's children yet. There is an elder daughter, Sarah Jane Parker Johnson, b.1861 and more sons, John Matthew Johnson b.1868 and John P Johnson b.1875 who appear in the census returns still to track down. I'm afraid that is all I have been able to find about the Johnson family so far ... but a search at the Barnsley Archives later this week might turn up something else.